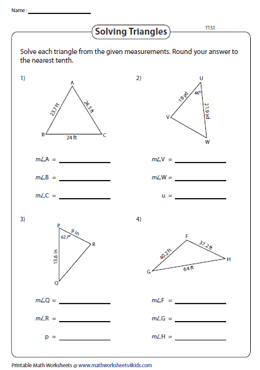 Explore our library of the law of cosines worksheets to solve for the unknown angle or the missing side of a triangle. The law of cosines is a formula that relates the three sides of a triangle to the cosine of the included angle. Gain a comprehensive understanding on the cosine law by downloading our rich resources on a variety of topics like finding the missing side, finding the unknown angle, solving each triangle and many more. 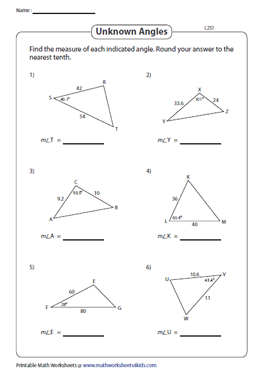 These worksheets are primarily designed for high-school students. Incorporate the cosine formula a2 = b2 + c2 - 2bc cos A to determine the length of the third side of each triangle. This section focuses on finding the indicated angle using the sides of a triangle. Rewrite the formula with the angle as subject, substitute the known values and determine the angle. 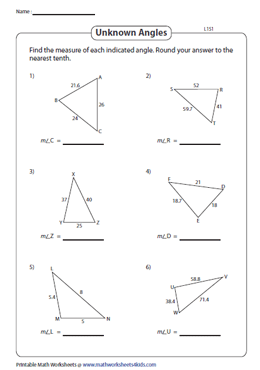 Learn how to determine the measure of the indicated angle with this series of level 2 worksheets. The first step is to find the missing side and then use the length of the missing side to calculate the measure of the unknown angle. Apply the law of cosines to find the missing side or unknown angle in each triangle. 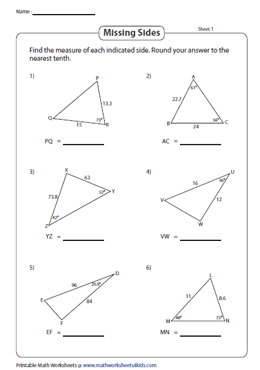 Engage students with ample practice to brush up skills on solving triangles. 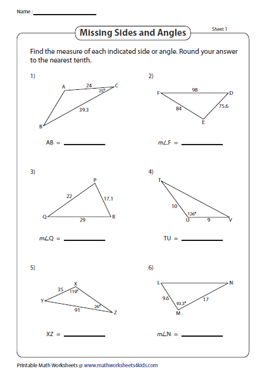 The exercises in type 1 worksheets are represented in figures. Apply the law of cosines to find the remaining sides and unknown angles using the known information. Familiarize yourself with the cosine law as you work through the exercises presented in the word format. 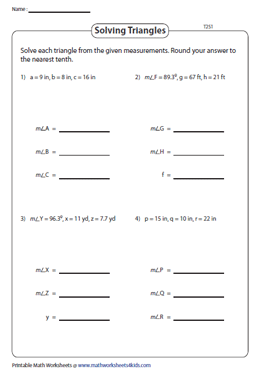 Tackle the set of four challenging problems that are featured in each printable worksheet.